Dawn is our reward. 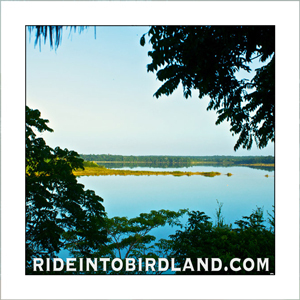 It’s 5:45 a.m. in Punta Laguna and a landscape of mirror-like waters, framed by tropical vegetation, is slowly being unveiled before our eyes. I take in the dimly lit view and make a few frames of a motionless canoe that seems to embody the stillness of the place. We’re looking for birds but they’re nowhere to be seen. In fact, we don’t even hear them. This landscape is eerily silent. 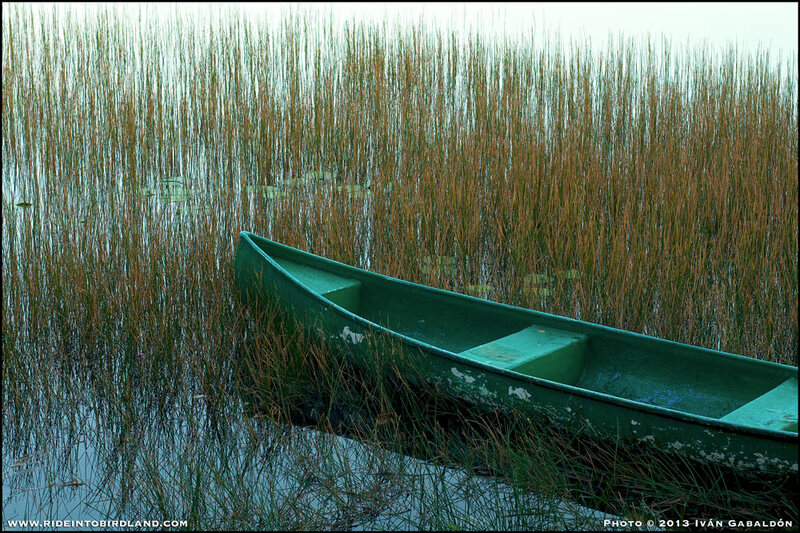 A canoe rests motionless in Punta Laguna as the sun rises. (Photo © Ivan Gabaldon). The lagoon keeps us under its spell until the sudden sound of shuffling leaves draws our attention to the trees behind us. Something of substantial weight is active up on the canopy, noisily flexing branches and coming closer to us. We catch glimpses of moving shadows through layers of foliage, then a curtain of leaves opens to reveal the face of a Spider Monkey as it pokes its head out and gives us an inquisitive look. 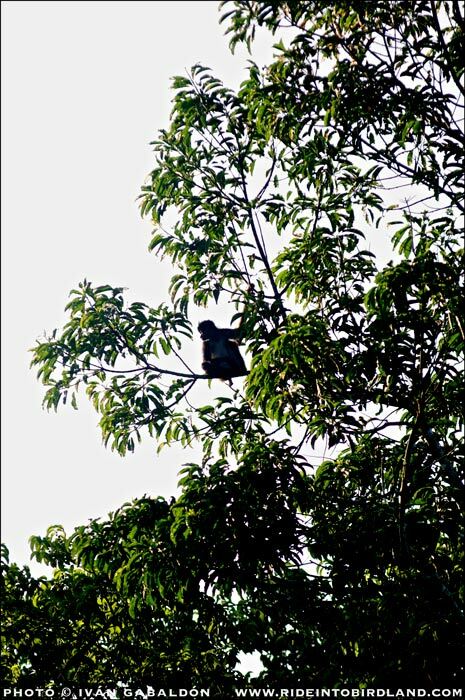 The first Spider Monkey we see seems to be scouting the area. (Photo © Ivan Gabaldon). He’s soon followed by at least twenty more monkeys, a whole group out for a morning stroll in search of sunlight and fruits. 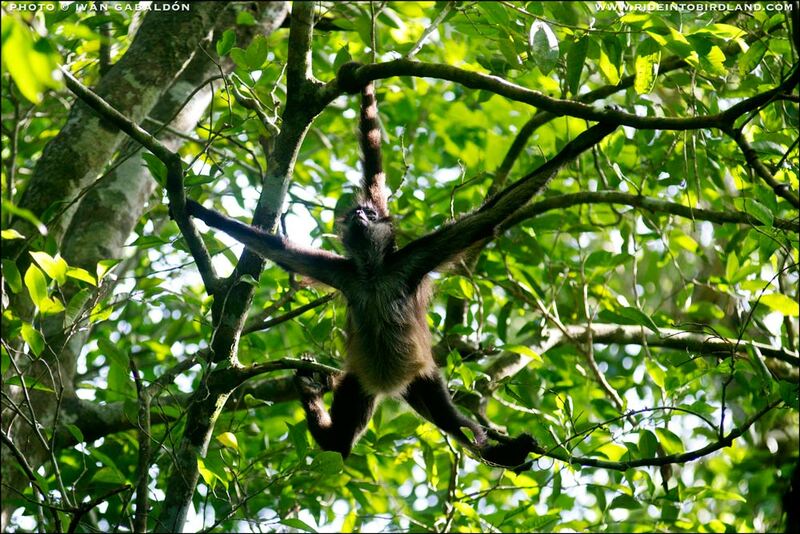 Spider Monkeys (Ateles geoffroyi) can weigh up to 9 kilograms and are very impressive acrobats. Nature has equipped them well, with mighty arms (which are longer than their lower limbs), hook-like hands specially adapted for hanging from branches and a powerful prehensile tail capable of supporting their full body weight, a very useful fifth limb. To all practical effects, Spider Monkeys have five limbs, not four! (Photo © Ivan Gabaldon). We spring into action, each photographer looking for a better position from where to photograph. 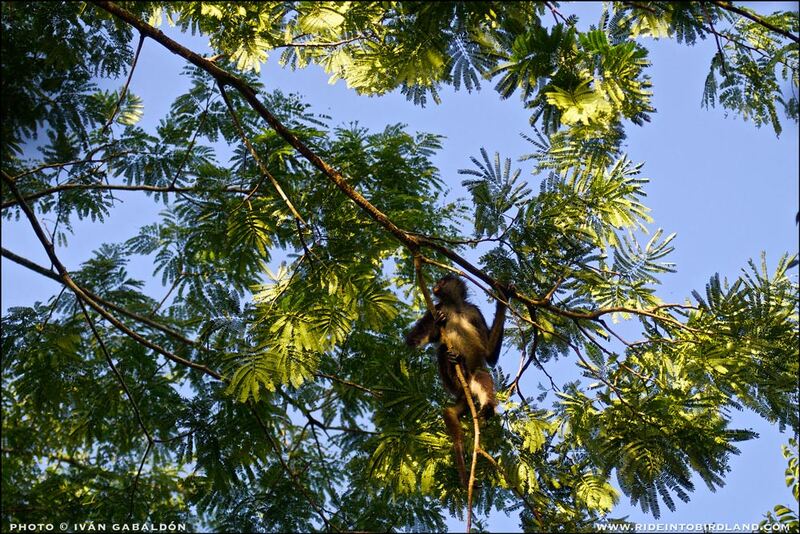 We can see male and female adult monkeys, as well as juveniles and mothers with infants. The monkeys stare down on us from their elevated habitat, sometimes straight into our cameras, but once their initial curiosity is satisfied they choose to ignore us and remain focused on their breakfast routine. 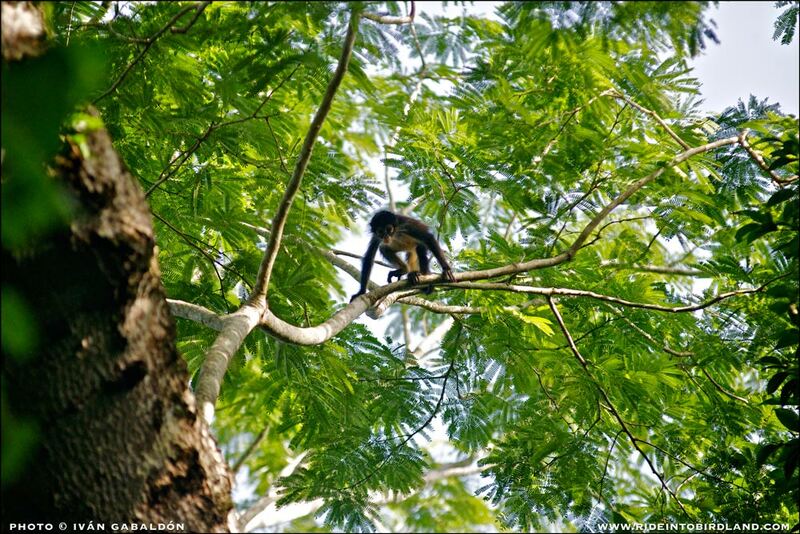 A young Spider Monkey travels with ease along the tree tops. (Photo © Ivan Gabaldon). Swinging from tree to tree without much apparent effort, they socialize amongst themselves and generally enjoy life in the forest’s upper level. They seem enthused by a single-minded quest for that next piece of fruit, which once found they pick and bite before dropping abundant leftovers on the forest floor below, thus sharing valuable nutritional resources with many species of ground dwelling creatures. 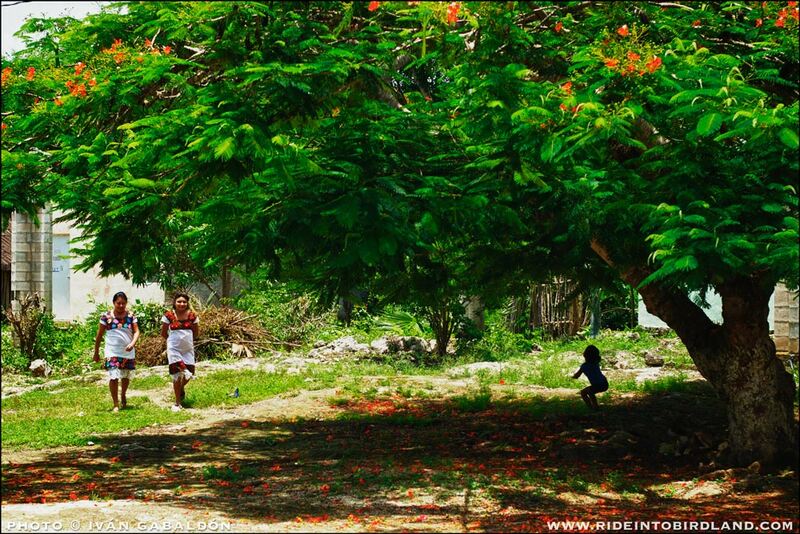 Looking for that next piece of fruit… (Photo © Ivan Gabaldon). …and eating it! (Photo © Ivan Gabaldon). 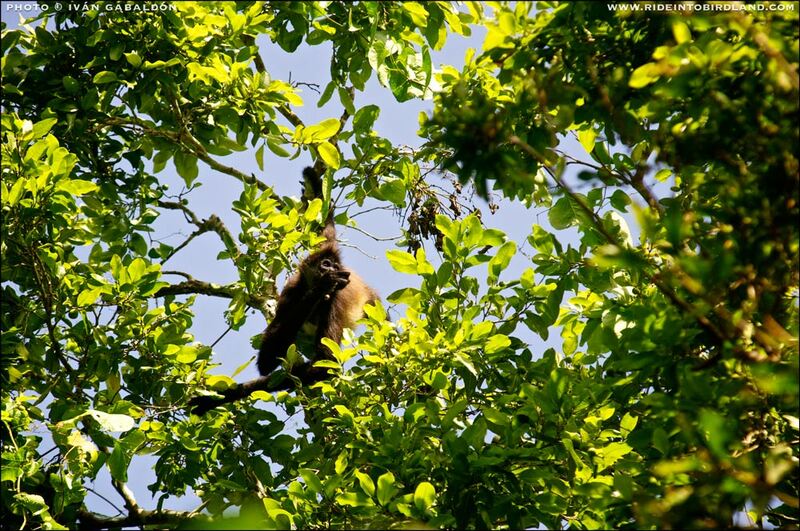 We try to stay with the monkeys, walking first along Punta Laguna’s path towards the main access road, then veering off along a side trail, our camera shutters constantly clicking. They finally head deeper into the forest, way beyond beyond our reach, but we continue to hear them for several minutes. 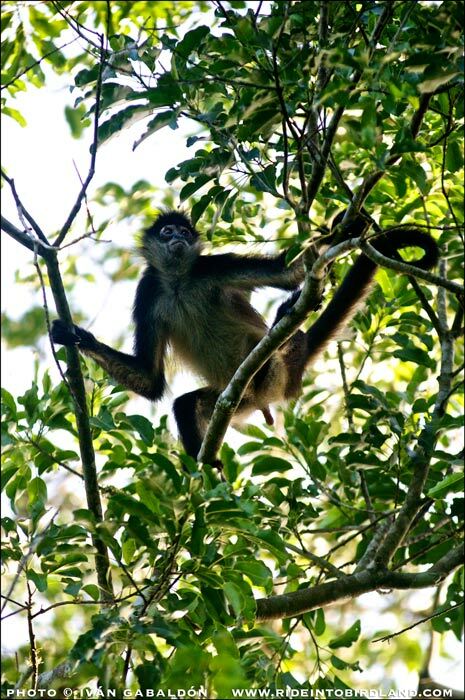 Punta Laguna, in Quintana Roo, is known as a great location to observe Spider Monkeys, yet we didn’t anticipate stumbling so effortlessly upon this captivating scene of life in monkey-land. We just happened to be in the right place at the right time. The quest for fruit is relentless. (Photo © Ivan Gabaldon). It all seemed to happen very fast but the meta-data in my images tells me I photographed my first monkey at 6:13 and the last one at 8:22, which means we had roughly two hours of beautiful morning light to capture these wonderful creatures in action. It truly was a photographer’s delight and a wonderful opportunity to witness and document the natural behavior of a charismatic species currently listed by CITES as endangered, victims of an ongoing loss of their natural habitat. As far as I’m concerned, this is what the magic of the Yucatan Peninsula is all about. Long live the Spider Monkeys! Do monkeys philosophize? I couldn’t help wondering after seeing this pensive Spider Monkey sitting on top of his world. 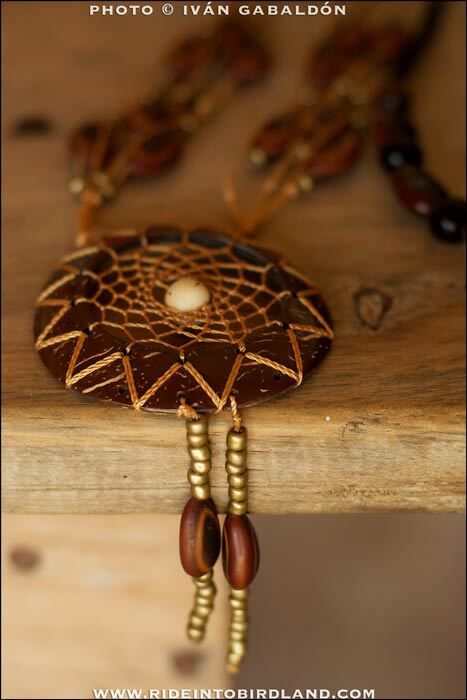 (Photo Ivan Gabaldon). Beyond Spider Monkeys and the blue lagoon. As memorable as our encounter with the monkeys has been, our visit today has higher goals and we must keep moving. Our group of four photographers (Cherie Pitillo, Carlos Ricalde, Marigel Campos and myself) is here by initiative of Pronatura Peninsula de Yucatan with a mission to photograph nature, people and everyday activities in Campamento Hidalgo and Cortés, two communities located on the way to Punta Laguna and within the zone of influence of “The house of the monkey and the puma” (Otoch Ma’ax Yetel Kooh in Maya), an officially designated “Area for the Protection of Flora and Fauna”. 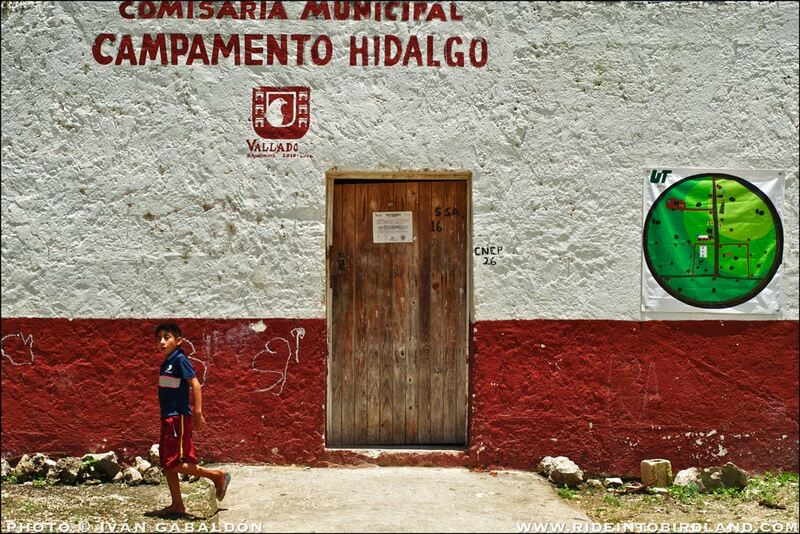 A child walks by the “comisaría” in Miguel Hidalgo. (Photo © Ivan Gabaldon). Punta Laguna’s beauty and its proximity to the Cobá archeological site have made it an attractive stop for tours going to or coming from that ancient Maya city, as well as for independent travelers who are lured here by the lagoon’s fabled colors and the area’s potential for nature observation. The resulting flow of tourists has created money-making opportunities for the local communities, which they have been quick to seize by offering “nature rides” that include a zip-line experience through the forest and over the lagoon, a short rapelling descent into a cave with subsequent on-foot exploration, and canoe paddling on the lagoon’s shallow waters. These activities, meant for active travelers but requiring no previous training, are a fun way to experience the area’s rich ecosystems. 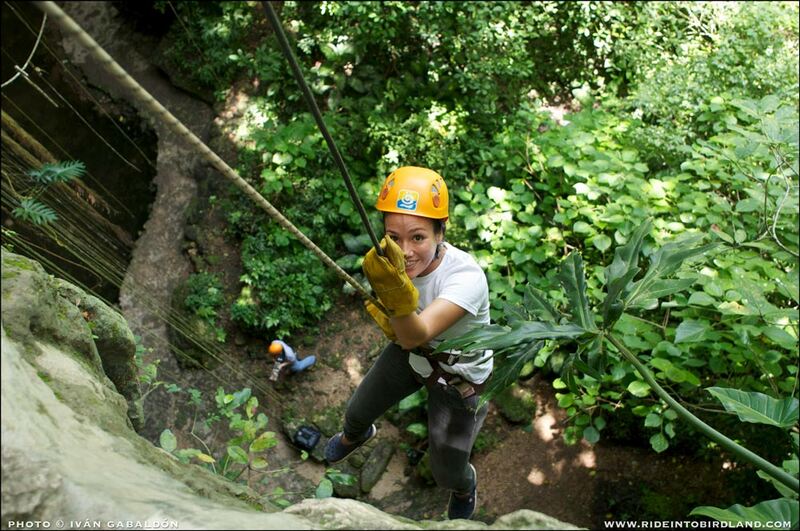 Georgina Castro, a staff member at Pronatura Peninsula de Yucatan, enjoys the descent into the cave. (Photo © Ivan Gabaldon). 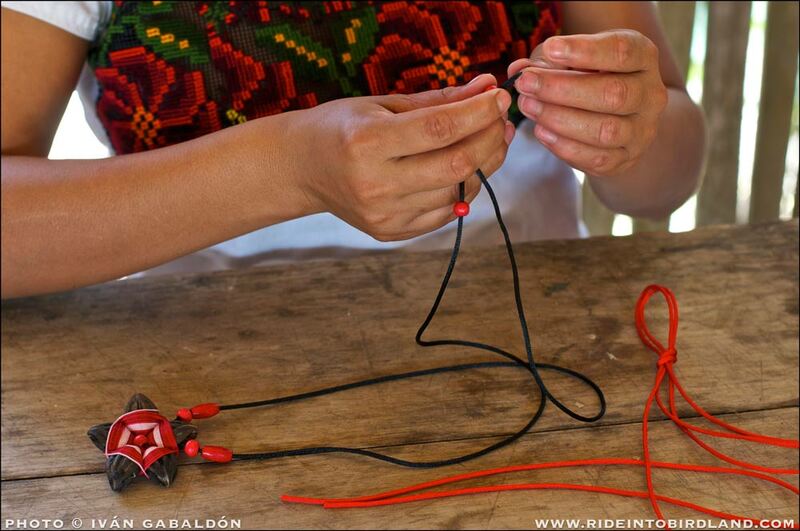 Pronatura Peninsula de Yucatan is also working in a joint effort with the ADO Foundation to help empower local girls and women so they too can tap into this new sources of income. 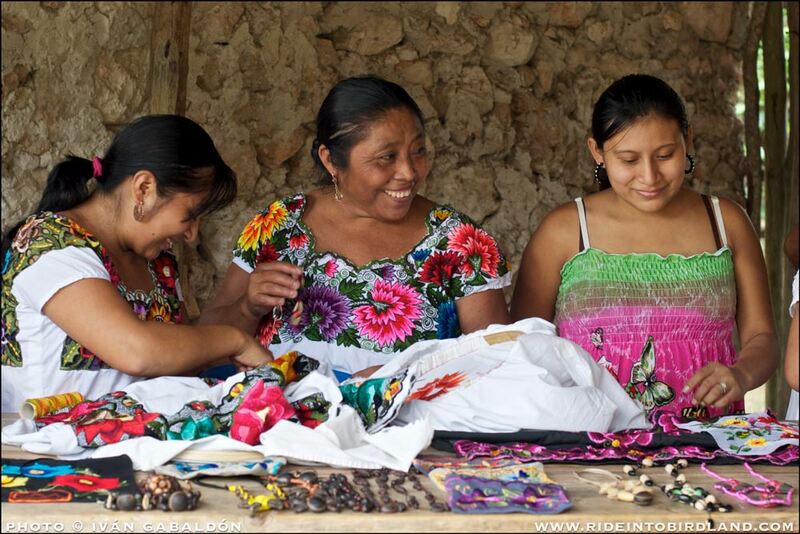 Neatly dressed in their beautiful hipiles (the traditional Mayan dress), these smiling young women produce colorful fashion accessories using fibers, seeds and recycled materials. Local women to continue arrive at the communal store, where we will be photographing them. (Photo © Ivan Gabaldon). Smiles are plentiful! (Photo © Ivan Gabaldon). The communal store they initially sold their wares from was too removed from the main road to attract enough potential customers, so PPY has helped coordinate efforts to erect a new space, now much closer to the road and therefore more enticing to buses and cars driving through the village. 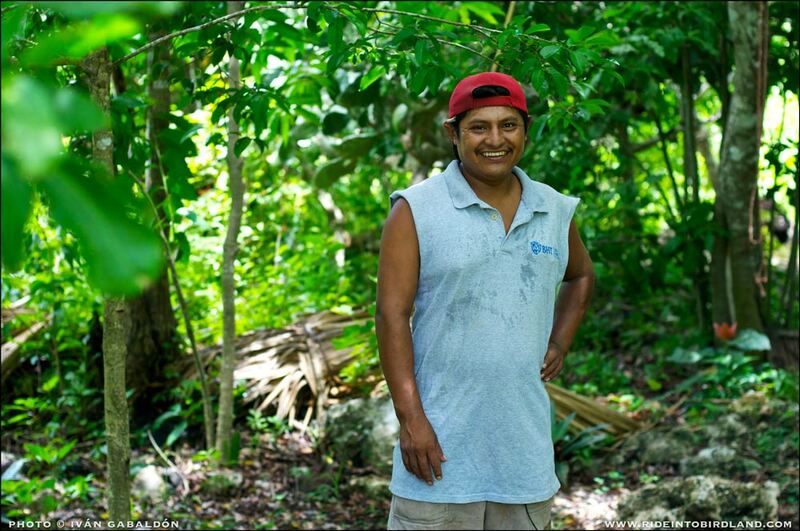 People in these peaceful, present-day Maya communities speak mostly in the tongue of their ancestors, but this should not be seen as a barrier, their demeanor is very gentle and they’re eager to welcome visitors. Hands at work. (Photo © Ivan Gabaldon). Nature motifs are predominant. (Photo © Ivan Gabaldon). 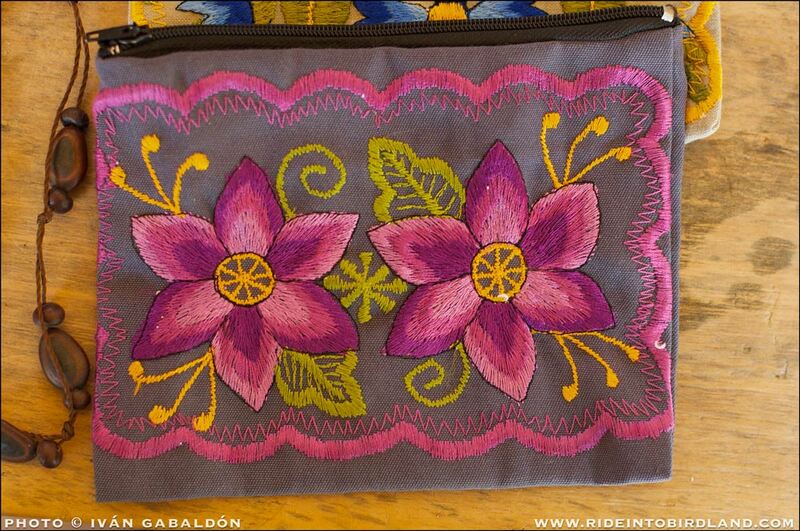 A finished purse. (Photo © Ivan Gabaldon). 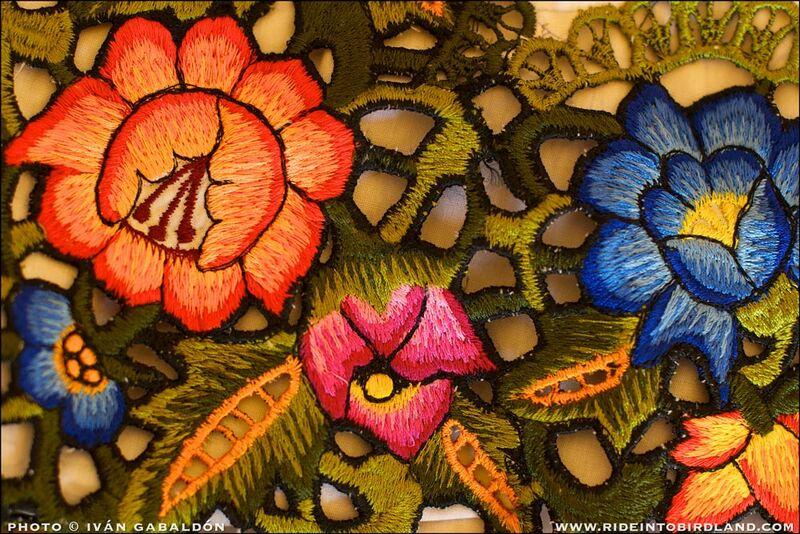 A close-up look of the embroidery work. (Photo © Ivan Gabaldon). 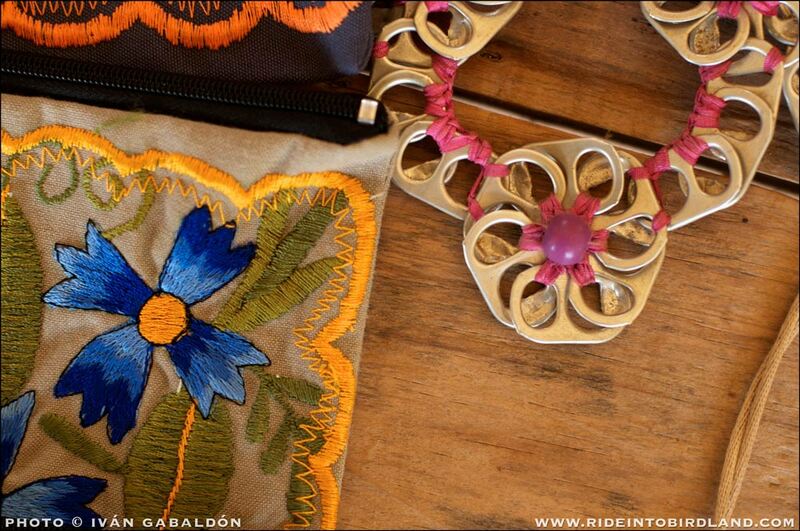 Recycled materials are also used. (Photo © Ivan Gabaldon). 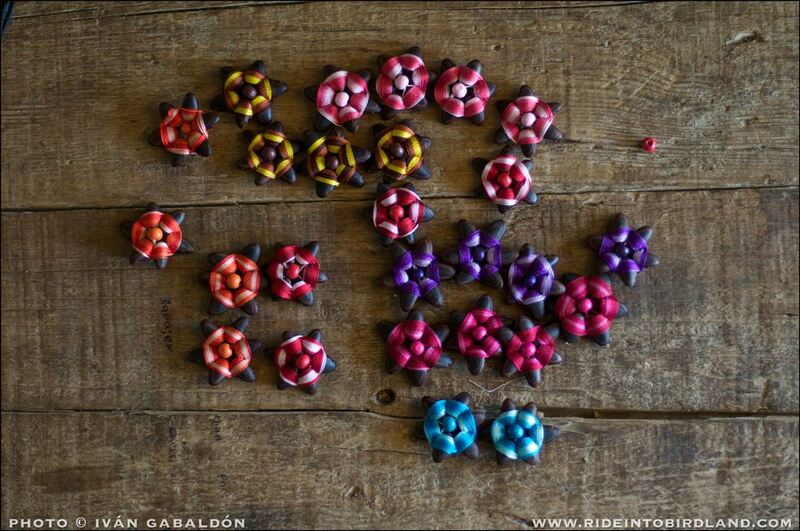 Fibers and seeds, transformed. (Photo © Ivan Gabaldon). Mexican hats couldn’t be missing! (Photo © Ivan Gabaldon). Leaving the ladies to their work, we move on to meet a few of the local men. A farmer gives us a full tour of his milpa, a carefully tended patch of land where he grows a variety of fruits, vegetables, herbs and flowers. I’ve never seen farming like this before, using every available pocket of good soil in what is predominantly rocky terrain. Plants intermingle in perfect harmony and without apparent order, much unlike the uniform, single-species farming the modern world has accustomed us to. 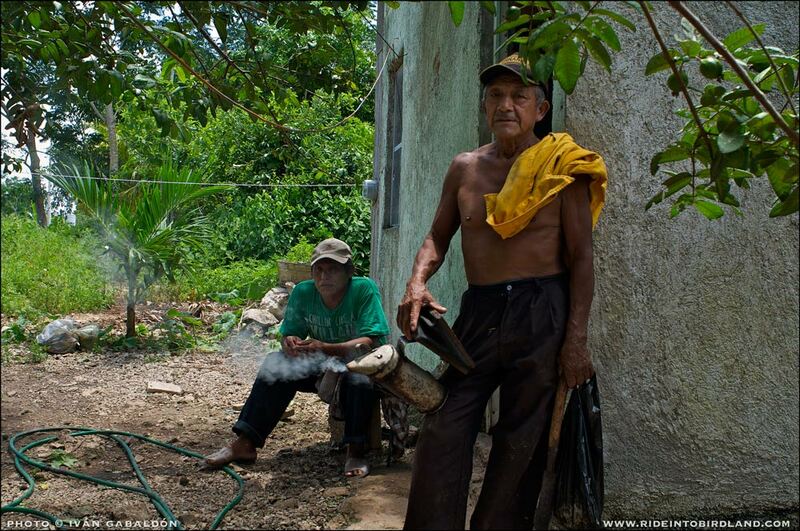 A friendly local farmer in Miguel Hidalgo. (Photo © Ivan Gabaldon). 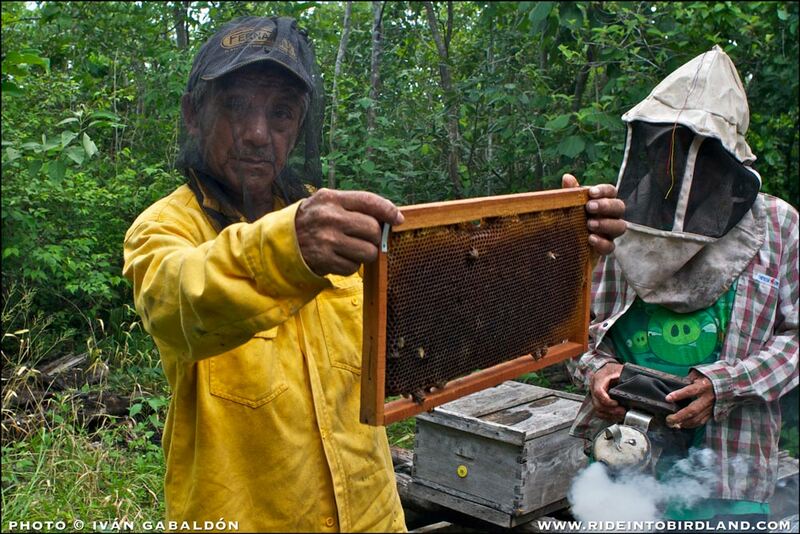 We then follow two bee-keepers who, bee smokers in hand, lead us into the forest until we come upon several buzzing beehives. They show us the bee colonies, which are currently recuperating from a population drop, and lend me protective gear so I can approach to photograph them. We’re told about the hardships of honey production, which include weather induced delays in flowering periods and frequent raids by wild animals like the mostly nocturnal Common Opossum (Didelphis marsupialis). 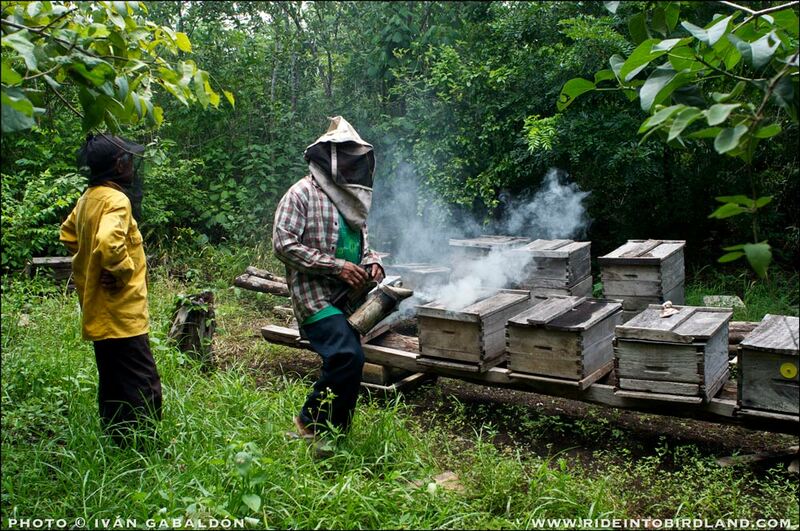 Beekeepers prepare to lead us out to the beehives. (Photo © Ivan Gabaldon). Smoke is used to appease the bees. (Photo © Ivan Gabaldon). Organic honey is produced in small-scale operations like this one all over the peninsula, later to be rounded up and shipped to buyers in the international market. Most of the golden product ends up in Germany but it can also be purchased locally when passing through towns and villages, usually offered for sale in recycled PVC containers. 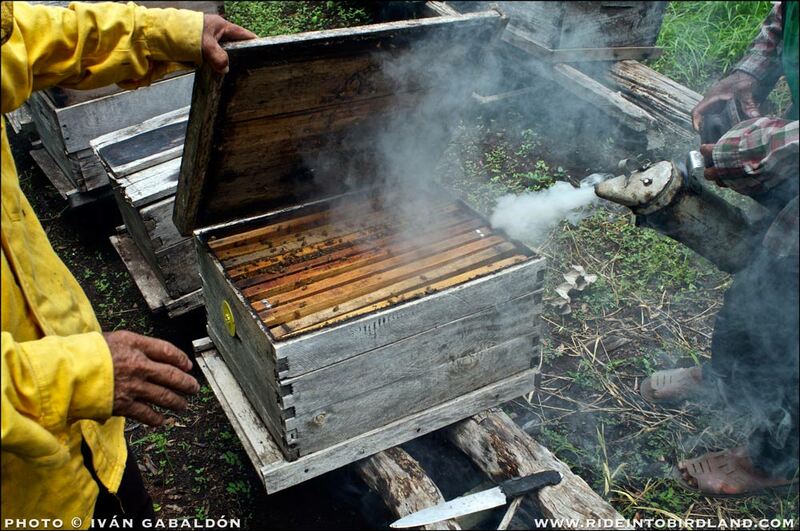 More smoke is used as the beehives are opened. (Photo © Ivan Gabaldon). There should be many more bees here, but the colony is recuperating from a population drop. (Photo © Ivan Gabaldon). Wearing protective gear I can come closer to photograph the bees. (Photo © Ivan Gabaldon). Near the end of our visit we enjoy a simple but pleasant lunch in a roadside restaurant owned and operated by a friendly local family. As we prepare to depart, a large bus stops to unload a large group of european visitors. Their presence confirms the relevance of efforts taking place here, as there is a direct correlation between these new sources of income and the capacity of local communities to improve their standard of living. Girls and boys in Miguel Hidalgo. (Photo © Ivan Gabaldon). A stronger local economy also helps keep families together and empowers them to preserve their traditions and protect the area’s ecosystems. These are powerful reasons to include a visit to Punta Laguna in every savvy traveler’s plan through the beautiful states of Quintana Roo and Yucatan, specially if one is eager to experience life beyond the plush confinement of Riviera Maya “sun-and-sand” resorts. 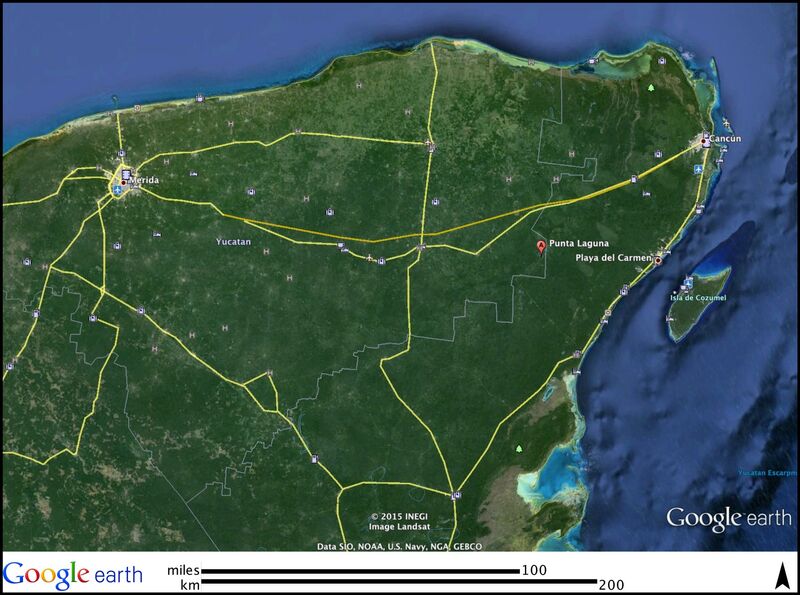 Punta Laguna is located in the municipality of Chemax, in the State of Yucatán, some 44 kilometers from Tulum and near the border between Yucatán and Quintana Roo. (Map by Google Earth). More information about this positive action project can be found at visitotoch.com (site currently under construction but slated for completion by the end of March/2015). Be sure to also visit the website of Pronatura Peninsula de Yucatan, where you’ll learn about other ongoing efforts designed to preserve the natural and social landscape of this amazing part of planet Earth, the Yucatan Peninsula. 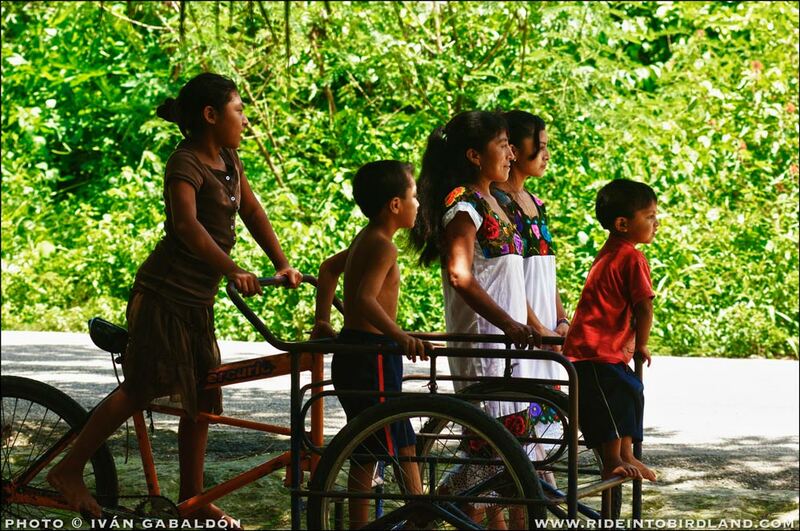 Do visit as well the website of the ADO Foundation, where you’ll find informaton (in Spanish) about their various programs to help preserve the environment, to provide educational opportunities for adult women and to make Mexico’s roads safer for everyone. IMPORTANT UPDATE: It has come to our attention that this Protected Natural Area and the social integrity of the families that live there is under threat by actions on the part of private interests foreign to these communities. Concerned by this, a group of researches is promoting a petition to urge authorities to take action and forestall this new threat. You can help by signing the petition and sharing it with your friends. Waste no time, do it now here: https://www.causes.com/campaigns/90562-garantizar-la-conservacion-del-anp-otoch-maax-yetel-kooh. 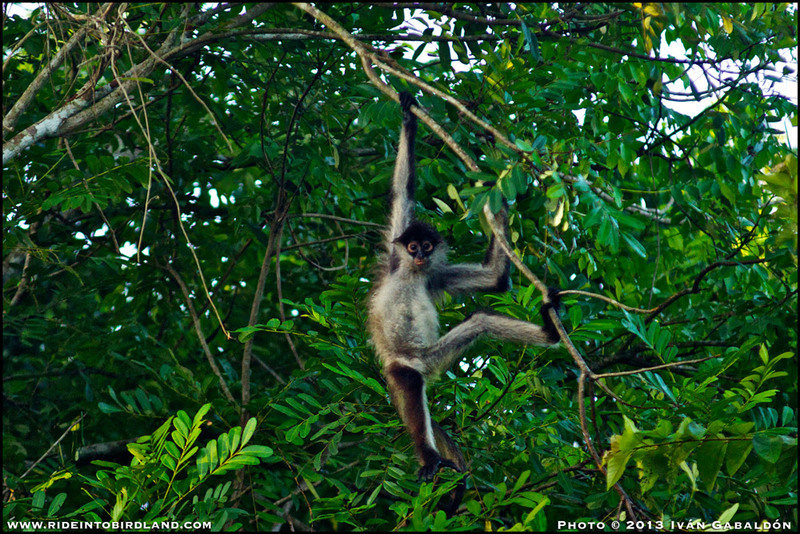 This entry was posted in Trip Reports and tagged punta laguna, quintana roo, spider monkeys, wildlife photograpy. Bookmark the permalink. Another fine report where you captured the essence of our experience in words and images. How brave to photograph the bees in your protective suit! 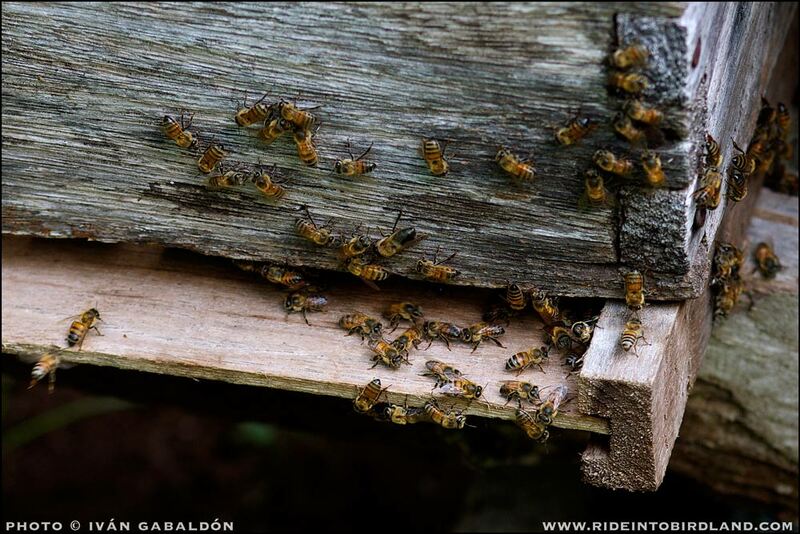 What an excellent sequence of photos of the beekeeping! Also what a nice tribute to those communities involved in protecting their natural resources while experiencing an eco-tourist income. 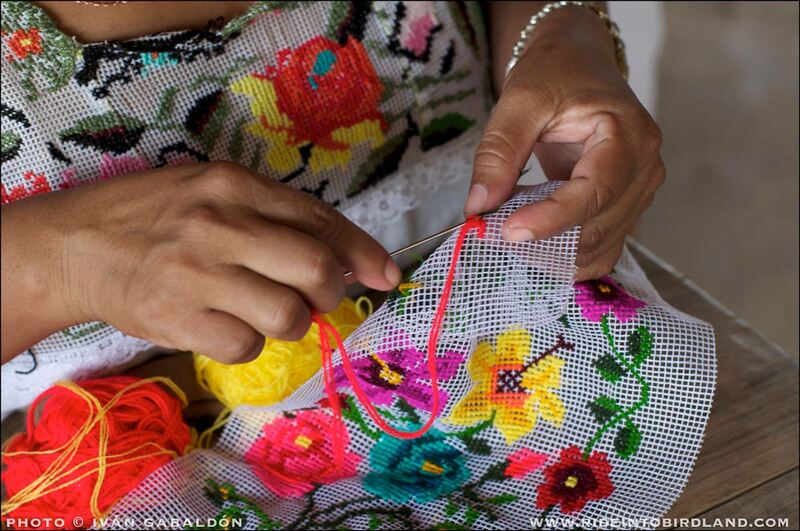 Thanks for sharing the hard work of these communities with help from Pronatura Peninsula de Yucatan. Thank you Cherie! It was my privilege to be there along with you and the rest of the team, so we could all lend a hand, however small, to Pronatura’s valuable efforts. Muy interesante el artículo, tengo la fortuna de conocer a una familia en Campamento Hidalgo y Punta Laguna es uno de mis destinos favoritos para ofrecer salidas y buscar aves. Mucho se dice en la red, pero al parecer los habitantes de Campamento Hidalgo sufren una especie de fraude por un abogado. Este comentario sirve para confirmar si esto ocurre en verdad en Punta Laguna y de ser así, si hay alguna posibilidad de conseguir apoyo por medio de ustedes. En Tulum muchos nos uniríamos a su causa, sólo nos hacen saber cómo podemos apoyar. Te comparto esta información respecto a una iniciativa a la cual nos estamos sumando con esta petición, creo que está asociada a tu comentario. Junto con un grupo de investigadores estamos apoyando esta iniciativa a favor de esta reserva, es una iniciativa seria con información técnica de soporte. Les solicitamos lean la información y en su caso su apoyo, ya sea institucional o personal, para firmar la petición que se está haciendo en el sitio: https://www.causes.com/campaigns/90562-garantizar-la-conservacion-del-anp-otoch-maax-yetel-kooh. También está en Facebook.